For the years of 1950 to 1970, Shang Wah Long Company was located at 304-306 Park Avenue, a Chinese Grocery/Gift Shop. It was relocated from Mulberry Street (US Route 40 East). It grew to a larger size. The White Rice Inn was located at 320 Park Avenue, a Chinese Restaurant. Within the 300 block Park Avenue were other shops and several Chinese Family "surname" Associations were present. Expansion of Chinese influence was through additional Chinese Restaurants about town by names of The Rice Inn (Sandtown Winchester), The Ho Joy Restaurant (Middle River), The Rice Bowl (Glen Burnie), and Golden Star (Waverly). The cooking style/cuisine was "Cantonese." During the life span of the "Baltimore Chinatown" Chinese Lunar New Year was celebrated. Refer, to definition of Chinese zodiac. A Chinese Dragon Dance, fire cracker, dancing, passing out "Lucky Red Envelopes." Chinese movies were shown in Chinatown at the On Leong Association. Chinese language schools, at different times, were located in On Leong Association and Grace and Saint Peters Episcopal Church. ^ "Little Ethiopia". Archived from the original on 2014-04-24. ^ a b c d e "Baltimore Chinatown History, University of Maryland". Archived from the original on 2011-03-12. ^ Rachel Rabinowitz (January 6, 2013). "Baltimore's Chinatown". Baltimore Maryland Agent. ^ "Baltimore's historic Chinatown again an immigrant hub". ^ a b "In Baltimore's forgotten Chinatown, a new festival will celebrate Asian-American history and culture". 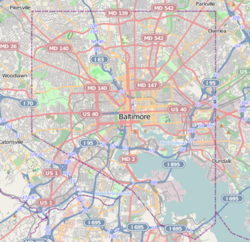 ^ "Baltimore City, Maryland Statistics and Demographics (US Census 2000)". ^ "United States—U.S. Statistics—Census Data—Maryland". ^ Julie Scharper (March 2, 2008). "The `where' of Chinatown: Rekindling its vitality has support, but site is in dispute". The Baltimore Sun. Wikimedia Commons has media related to Chinatown, Baltimore.